As leaves disappear from our poplars, oaks and maples, the sounds of the forest change. No longer are clicks and groans muffled as strong winds rub branches together. Acorns lightly plop to the earth. The rustling of fallen leaves magnifies the presence of scurrying small animals. These are ordinary melodies heard in winter’s sweep of wooded areas. David Haskell’s The Songs of Trees (Viking Press, 2017) expands the sounds and botanical activities of trees to orchestrate their effects on various cultures and societies. From his botanical viewpoint, Haskell describes the importance of twelve trees from various locations around the world. Each tree is described scientifically from the fungus on its roots to the leaves at its crown. The author groups the trees by whether they are isolated from human contact, are fossilized remains or exist in cities and fields. He explores each tree’s relationship with its surrounding’s past and impending future. 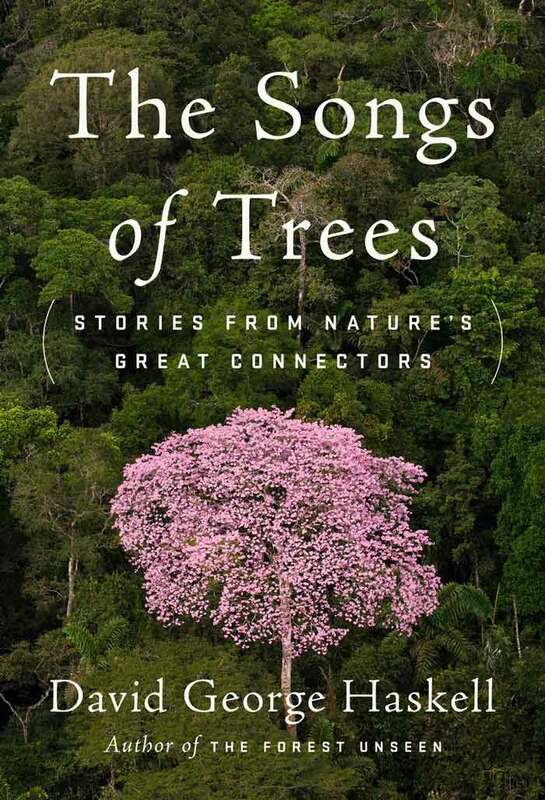 The book opens with a climb to the top of a ceibo, an enormous tree growing near the center of the Yansuni Biosphere Reserve in the jungles of Ecuador. In addition to describing the tree in exquisite detail, Haskell describes how the deforestation caused by oil companies has impacted the indigenous inhabitants. These towering plants are part of the people’s sense of existence. Fortunately, an important court case recently granted redemption for the trees from destruction for the near future. Haskell’s experience in a Scottish laboratory while examining hazel wood charcoal burned ten thousand years ago begins another chapter. Hazel trees surrounded the home sites of Mesolithic settlers. These trees consistently regrew when trimmed for fuel, and those that were left uncut provided nuts for food. The original site where this particular charcoal was found is now on a noisy street near a coal-powered heating plant. Hazel trees are presently being replanted there. The past abundance of hazel trees that were once here has now migrated to a cooler, wetter area of Scotland, but the dilemma of how to provide heating while controlling pollution remains. An olive tree at the Damascus Gate of Jerusalem is the subject of another of Haskell’s studies. Here he muses over the ability of olive trees to adjust to the availability of water in their required sunny climates. Olive roots, leaves and trunks dramatically change their shape, growth depth and size depending on the humidity and access to water. As he visits olive farms, Haskell considers the relationship between the olive tree’s adaptability and the political plight between the Israelis and Palestinians. Although this book has no illustrations, Haskell’s descriptions of the trees, whether a small bonsai or a giant redwood, make visualization of the plant clear. Information from botany, geology, anthropology, sociology and literature are included by Haskell to clarify the beauty and uniqueness of the trees within their locational context. This book is not a page-tuner. Haskell has instead created a volume of elegant writing perfect for contemplation during the grayness of winter. Christine Thomson is a Raleigh gardener obsessed with plants. She is a volunteer at the JC Raulston Arboretum and fills her spare time reading books, especially volumes about vegetation.